“Travel is fatal to prejudice, bigotry, and narrow-mindedness, and many of our people need it sorely on these accounts. Broad, wholesome, charitable views of men and things cannot be acquired by vegetating in one little corner of the earth all one’s lifetime.” – Mark Twain. Summertime arrives, and many of us travel near and far, and that’s great. As our world gets smaller and smaller, and seemingly crazier, an escape, an adventure, a mind opening experience, a new path, all seem appropriate. The journey might be five minutes away or 5,000 miles-both count and both matter. 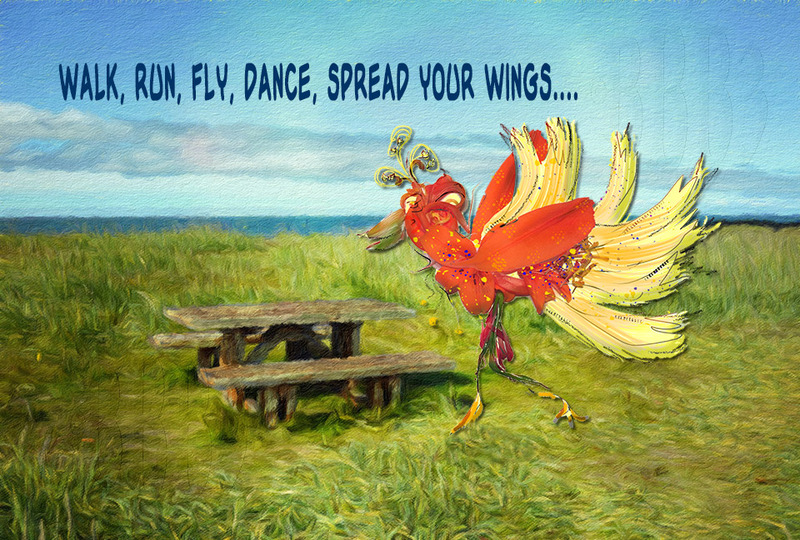 Spread your wings, fly, walk, run, ride (whatever is your pleasure) and discover your destination. • It was Tuesday morning. • I was a bit nervous! • I picked up my basket, took a deep breath, and jumped in with both feet. • My audience was unfiltered truth tellers – Toddlers! • Kids tell it as it is, they would either be interested and engaged or not. • My stage was story-time at the local library. To my total delight, the kids were totally engaged! On each page, they were chanting the word Awesome with me. They were searching for Fuddles, and enjoying themselves! I was (and still am) THRILLED. For those of you unfamiliar with my book – called Awesome, here is a bit of info: It is for the younger set – three to about six, maybe seven-year-olds. The words of the book are simple, however, the concept is not. It is about Awesomeness, and what makes something/somebody awesome. The illustrations are a large piece of the book and in part carry the younger children along. I see lots of potential for interactions and ‘projects’ that can weave their way around the themes of kindness/awesomeness. I am working on many ideas, so, stay tuned! I am looking for places to read to more kids-schools, libraries, playgroups, even parties! Have other ideas of places? If you are interested, or know anyone else that may be, please contact me at botanicalbb3@gmail.com. Author Botanical Beauties and Beasties©Posted on 02/09/2017 Categories Art, ART and ARTIST, Awesome, Beasties, Birds, Book, Botanical Beauties & Beasties, Botanicals, Children Picture Book, Children's Picture Book, Children's Picture Books, Drawings, Ecological items, Ecology, environment, Flowers, Fuddles, fun, Garden, Gift ideas, Green ideas, Whimsy1 Comment on 32 pages of Awesomeness! 32 pages of Awesomeness unfurl at the library! I was a bit nervous! I picked up my basket of books, a few other supplies, took a deep breath and jumped in with both feet. My audience was unfiltered truth tellers – Toddlers! Kids tell it as it is, they would either be interested and engaged or not. My stage was story-time at the local library. 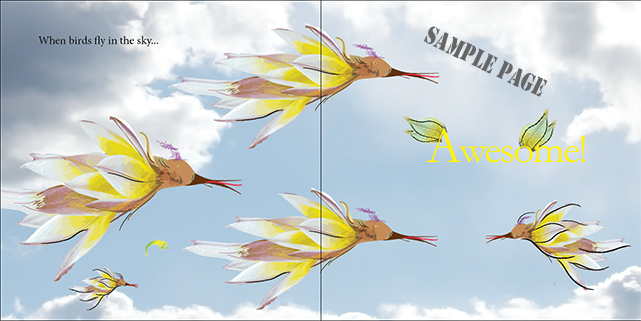 Sample Page- Birds fly – Awesome! For those of you unfamiliar with my book – called Awesome, here is a bit of info: It is for the younger set – three to about six, maybe seven-year-olds. The words of the book are simple; however, the concept is not. It is about Awesomeness, and what makes something/somebody awesome. The illustrations are a large piece of the book and in part carry the younger children along. I see lots of potential for interactions and ‘projects’ that can weave their way around the themes of kindness/awesomeness. I am working on many ideas, so, stay tuned! I am looking for places to read to more kids-schools, libraries, playgroups, even parties! If you are interested, or know anyone else that may be, please contact me at botanicalbb3@gmail.com. If you are interested in purchasing a copy, please contact me at botanicalbb3@gmail.com. Please put Book Purchase in the subject line. 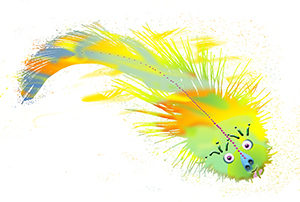 Author Botanical Beauties and Beasties©Posted on 02/08/2017 02/08/2017 Categories Art, ART and ARTIST, Awesome, Beasties, Birds, Book, Botanical Beauties & Beasties, Botanicals, Children Picture Book, Children's Picture Books, Drawings, Ecological items, Ecology, environment, Flowers, Fuddles, Gift ideas, WhimsyTags children’s book, Picture book for kids1 Comment on 32 pages of Awesomeness unfurl at the library!